Chanukah is the annual Jewish festival of lights and celebration of oil. Families play with dreidels, receive gifts and chocolate coins, light the menorah and eat foods cooked in oil such as potato pancakes and doughnuts. It's definitely a tasty holiday and usually receives a lot of attention because of its close proximity in time to Christmas. My mother was known far and wide for her excellent latkes. She would grate large quantities of potatoes by hand with record speed. 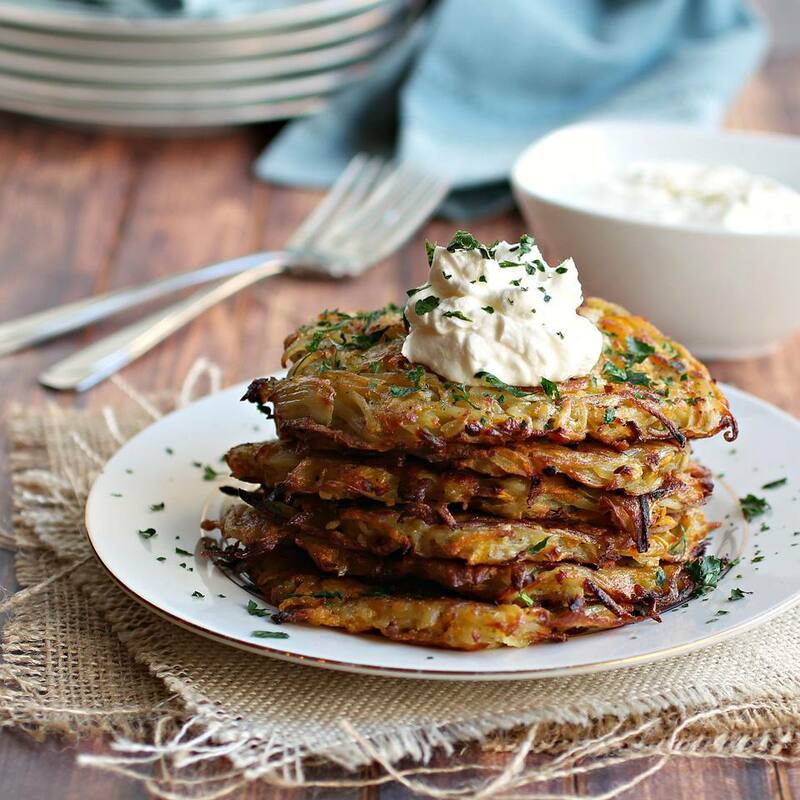 The smell of frying potato pancakes still instantly brings me back to childhood and to a houseful of eager guests, Jewish and gentile, ready to dive into to a hot stack of pancakes. She was a purist and only used regular potatoes and a bit of onion but I think it's fun to mix it up. I've tried plenty of combinations and liked most of them but butternut squash might be my favorite. It adds a bit of sweetness which I contrast with a good sprinkling of za'atar. And while traditional latkes are topped with either apple sauce or sour cream, I took it a level up with thick tangy labneh. The cool yogurt cheese on top of the hot crispy pancakes is heavenly and the finishing bit of spice turns an old world recipe into a gourmet taste. The Chanukah festival lasts for 8 nights and I think we should eat a different form of latke on each night. Whose with me? You can grate the shallot, potato and squash by hand on a box grater but it's easier to use the grating attachment on a food processor. Begin with the shallot, then the squash and then the potato. Transfer the grated vegetables to a large bowl and mix in the egg, flour, salt, za'atar and pepper. Heat the canola oil in a large skillet or cast iron pan. Drop spoonfuls of the batter into the pan. I made mine about 3" but you can make them smaller or larger. Fry on medium heat for about 5 -7 minutes on each side or until the pancakes are a light golden brown. Repeat until you've used all the batter. You can keep the pancakes warm in a 350 degree oven until the whole batch is cooked and you're ready to serve. Top with a dollop of labneh and an additional sprinkling of za'atar.